What is a Website Audit and Why Do You Need One? Why Do I Need A Website Audit For SEO? A website audit is a valuable step to creating a website that will attract customers and market your business better on search engines. With the sheer amount of traffic that exists on the internet, making your online presence noticed takes focused content optimization. As much as your customers want to find you, you need to find them. If your website is struggling to get the attention you think it should be, or you want to focus your services into a local area and you are not sure how to do it, a website audit is your first excursion into understanding what can be done better to improve your search engine results. In more technical terms, a website audit is similar to a business audit. Your website is checked against the regulations and rules set up by search engines – which are ever changing – and the quality of your website is tested against their parameters for what makes a high-ranking site. Everything on the website will undergo a full analysis to detect weak points and areas for improvement. 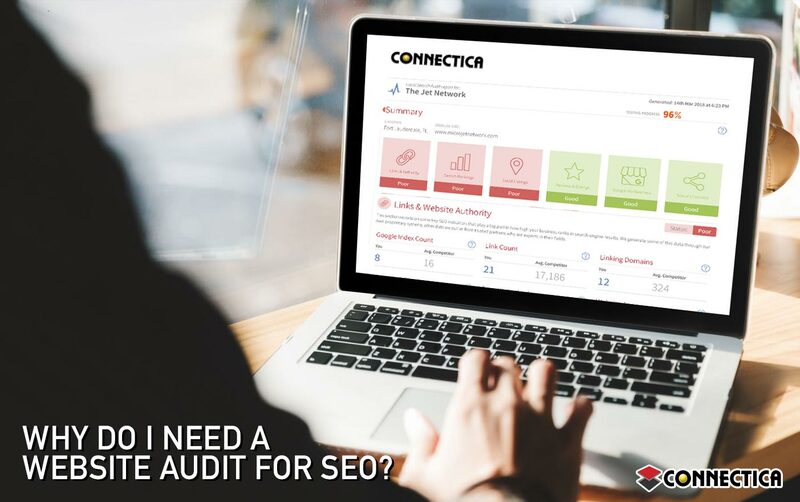 The result of the audit will give you a comprehensive report on the level of your site’s search visibility, which will allow us in turn to give you professional advice on how to combat the problem areas in a way that best suits your business. There are many types of website auditing that address different aspects of a site. Search engines used to just read keywords to rank your website higher than others, but with changing times they have adapted to read websites for ease of use, time spent on the page, URL usage, and authoritative value. Technical Audit – Checks the architecture of your website, and analyses performance such as loading speed, errors, broken links, page structure, etc. On-Site Audit – Fully reviews and analyses your site for keyword usage and H-tags, meta descriptions and URLs. Aims to assess their relevancy. Off-Site Audit – An analysis of the URLs on your site which lead to external sources. These are also checked for authority value and trustworthiness. Google Penalty Audit – Assesses websites for any algorithms or areas which may lead to penalty from the search engine and cause a lower ranking. Local SEO Audit – If you want your website to reach a more immediate local audience this audit checks how well you are doing that and which areas can be improved upon. Competition Audit – By auditing a competitor’s website you can gain a deeper understanding into what works for them and what parts of their site are successful. You can also use the audit to improve and learn more about the market your business is in. The purpose of the audit is to find out how to optimize your website for better marketing of your business. Once all keywords, content, URLs, etc. have been checked for their competency and placement, recommendations can be made about how to improve them. For instance, if you want to appeal to a larger audience, you need to include content that speaks to varying ranges of people. If you want your beauty site to appeal to millennials, you would use language and images that suits that age range and aesthetic. Similarly the audits for technical issues are also important because they show you exactly what may be hindering the success of your website, such as not being mobile friendly. You could use the best keywords for your service, but if customers cannot navigate around your site, or constantly receive errors they are likely to look elsewhere. You can also receive a review of where customers spend the most time, and where they leave your site. This will help you gauge the success of certain content over others. Doing a full audit annually, or even biannually, will keep your website up to date with the latest SEO parameters. Think of it as refreshing your website for seasonal marketing. If you want to stay on top you have to be current. Should You Try DIY Auditing? There are many websites out there that will help you to audit your own website. But we all know that going to a doctor is more likely to yield productive results than checking your symptoms online, no matter how well optimized the medical pages are. Having your website audited by professionals whose job it is to critically analyze your audit results will make the audit worthwhile. Connectica LLC are experts at web design and SEO optimization. We will be able to give you a detailed report on your website’s marketability, and better yet we will be able to advise you on how to use the information to create a website that really stands out at the top of the rankings. Using an online audit may give you results, but if you don’t know how to address them you won’t be able to make the most of your online piece of real estate. We can help you grow your online presence in a way that suits your individual business, you won’t be just another number in the search results.